Establish that the process equipment has the capability of operating within required parameters. Demonstrate that controlling, monitoring, and/or measuring equipment and instrumentation are capable of operating within the parameters prescribed for the process equipment. Confirm that over repeated cycles (runs) representing the required operational range of the equipment, that the output or product consistently meets predetermined specifications for quality and function. Require the implementation of an ongoing monitoring, re-qualification and recertification of equipment. Equipment needs to be “fit for purpose”, which will encompass user safety, ease of use, efficiency, environmental considerations (noise, fume emissions, etc..) in addition to the ability to consistently and reliability meet capability requirements in terms of output specifications. 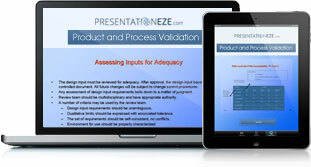 This document will define the expected capabilities of an item of equipment being ordered or built. The URS will normally be a non-technical document, with the focus on the ability of the equipment to provided pre-determined capabilities. Must fit into an area of a certain size. Needs to meet user safety requirements to regulatory standards. Will process 1000 units per hour. The URS may be complemented with a functional requirements document, where specific functional expectations are further defined. When planning and designing equipment it is necessary to ensure that the overall design and component parts selected will have adequate capacity to function for the intended purpose. The design needs to take account of ongoing needs, for example ease of routine maintenance, calibration requirements, cleaning requirements. The materials specified in the design should not compromise product integrity, e.g. lubricants used within equipment need to be considered in the context of the product being processed. The factory acceptance test allows inspection and testing of an item of equipment before it leaves a supplier. The clear advantages are that any deficiencies are identified in the supplier manufacturing facility, also the potential for delay or disturbance due to unforeseen deficiencies arising during installation are reduced. The time and extent of the installation qualification can also be reduced where certain aspects of an IQ are verified during the FAT. The factory acceptance test also facilities staff training, where staff can start to understand an item of equipment in advance of delivery. The factory acceptance test as per all test protocols will be performed in accordance with predefined procedures and predefined acceptance criteria. Safety features will be clearly defined and will be confirmed as effective. Will confirm that the equipment as received matches the original purchase specifications. Outlines the information required to provide evidence that all components of a system or of a piece of equipment operate as specified. As part of the operational qualification the standard operating procedures for operation, maintenance and calibration will be confirmed as being in place. The OQ will define the specification and acceptance criteria and will confirm compliant operation to the specification limits. The performance qualification will be performed after both IQ and OQ have been completed, reviewed and approved. The PQ describes the procedures for demonstrating that a system or piece of equipment can consistently perform and meet required specification under routine operation. The PQ will include descriptions of preliminary procedures required, detailed performance tests to be done, acceptance criteria. In addition will confirm that other supporting equipment used during qualification have been validated. 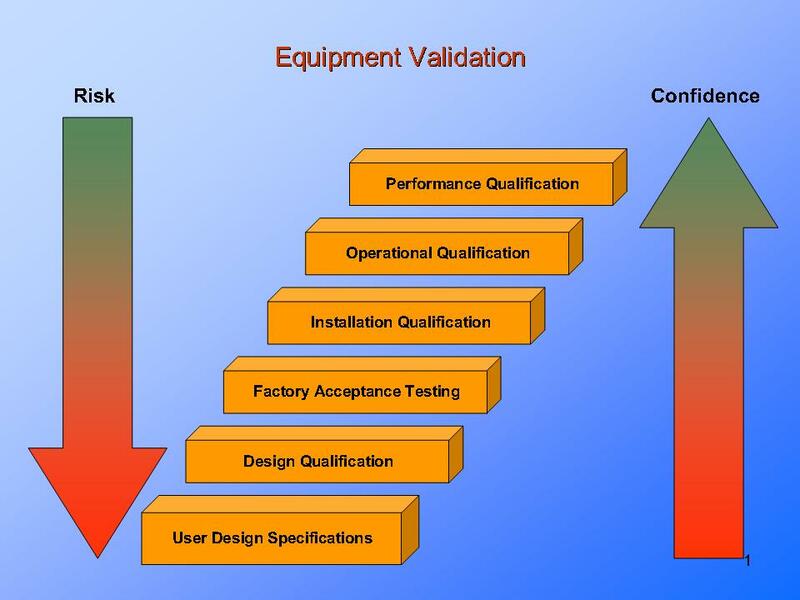 The effect of performing a comprehensive equipment validation and qualification is that the confidence in the ability of an item of equipment to perform as expected increases and consequently the risk to the organization and users decreases. The risk may be related to poor quality outputs, un-reliable operation, safety concerns, unexpected variation in operating characteristics, etc., etc..
Information and training presentation on Product & Process Validation.